The iPad makes it easy to sync up all parts of your life with little effort. For example, you can create an event on your iPad simply by using the contents of an email. Invitations sent to you in email that you accept have always been placed in the Calendar app automatically. In addition, Mail will create a Calendar event from certain information contained within an email such as a flight reservation. 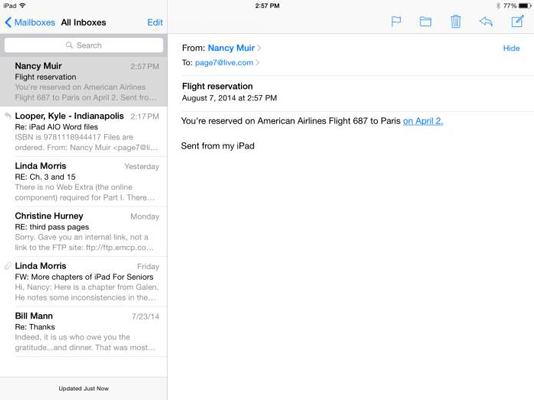 Create an email to yourself mentioning a reservation on a specific airline on a specific date and time. You can also mention another type of reservation, such as for dinner, or even just a phone number. Send the message to yourself and then open Mail. In your Inbox, open the email. Note that pertinent information is displayed in blue, underlined text. Tap some underlined text; choose Create Event. A New Event form from Calendar appears. Enter additional information about the event and then tap Done. Congratulations! You have just used your iPad to make life easier. Your iPad will now notify you of important information regarding your created event.